Okey Ndibe is the author of the novels Foreign Gods, Inc. and Arrows of Rain, the memoir, Never Look an American in the Eye: Flying Turtles, Colonial Ghosts, and the Making of a Nigerian American, and co-editor of Writers Writing on Conflicts and Wars in Africa. The New York Times as well as Philadelphia Inquirer, Cleveland Plain Dealer, and Mosaic magazine named Foreign Gods, Inc. one of the 10 best books of 2014. 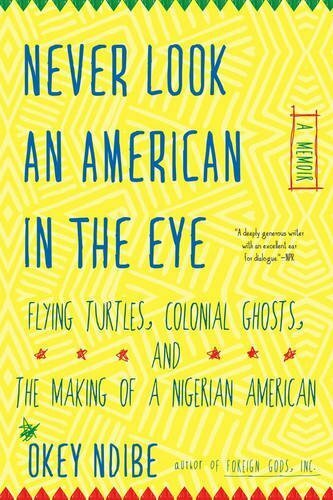 A funny, charming and penetrating memoir tells of Okey Ndibe’s move from Nigeria to America, where he came to edit the influential—but forever teetering on the verge of insolvency—African Commentary magazine. In this debut novel set in a fictitious post-colonial African nation, the discovery of a drowned prostitute leads to an exploration of the conflict between an individual and the modern African state. > Nigeria: why are we sleeping easy when terrorists have kidnapped our children? > The Shape of Things to Come? CITY LIGHTS BOOKSTORE SAN FRANCISCO, CA Reading and signing Okey Ndibe Arrives: 7:00 p.m. Begins: 7:30 p.m..” The memoir will be published on October 11, but can be pre-ordered now on Amazon. Italian translation of Foreign Gods, Inc. is published. Okey Ndibe receives Black Mountain Institute fellowship.